Several 2008–up factory head units with built-in navigation or video screen have an 8-pin socket for a rear camera. Most are already wired to the reverse gear signal, and will begin automatically displaying the camera image after you add this harness. 2005–2009 Legacy / Outback (North American models) and all Tribeca navigation. See this post. 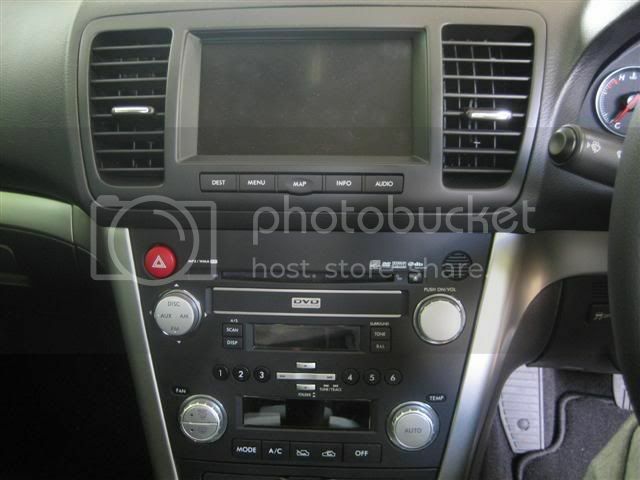 2012–up Impreza / Forester / BRZ OEM Fujitsu Ten navigation HUs. See 16-pin camera harness. Unsure whether your OEM HU is compatible? Contact me via e-mail and tell me your car's year and model, and your HU's model number (printed on the front). My 8-pin camera harness now has the head unit's enable input looped onto another pin that provides ground. So there is no longer a wire with a "fork" terminal that you must connect to chassis ground. 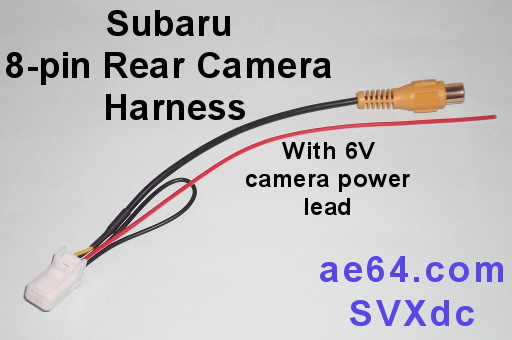 Recent Subaru OEM cameras are powered from the factory HU. The HUs have a pin on the rear camera socket which supplies +6 Volts. 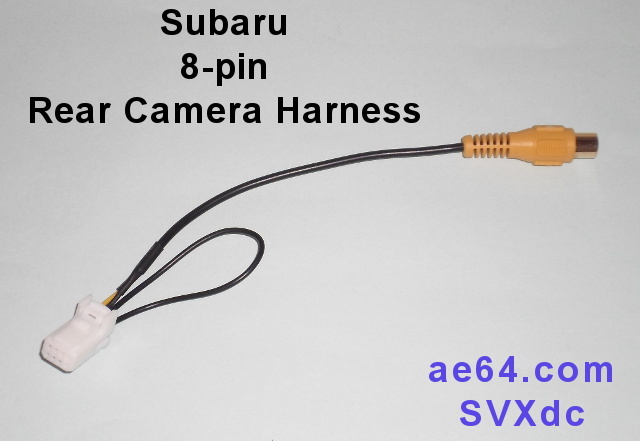 You can include the optional 6V lead on my camera harness for an extra $2. Most cameras (both OEM and aftermarket) actually operate internally at 3.3 or 5 Volts. People have found that many aftermarket cameras work from 6V. The Rydeen DUO and MINy are confirmed to work from 6V (and have been very popular with Subaru owners). If you're unsure about your camera, I recommend that you test it from 6V. Also be sure to test in low light. People have run across some cameras that look OK from 6V in daylight but have noticeable degradation from 6V in dark (and needed a slightly higher voltage). Powering a camera from the HU's 6V lead may make your installation easier — you won't have to tap into another +12V wire for the camera, and the HU will only turn on the camera when needed. If you plan to retrofit an OEM camera (in a car that was not factory pre-wired for a camera), you'll definitely want to include the optional 6V lead. The OEM cameras have a short harness with a proprietary plug. 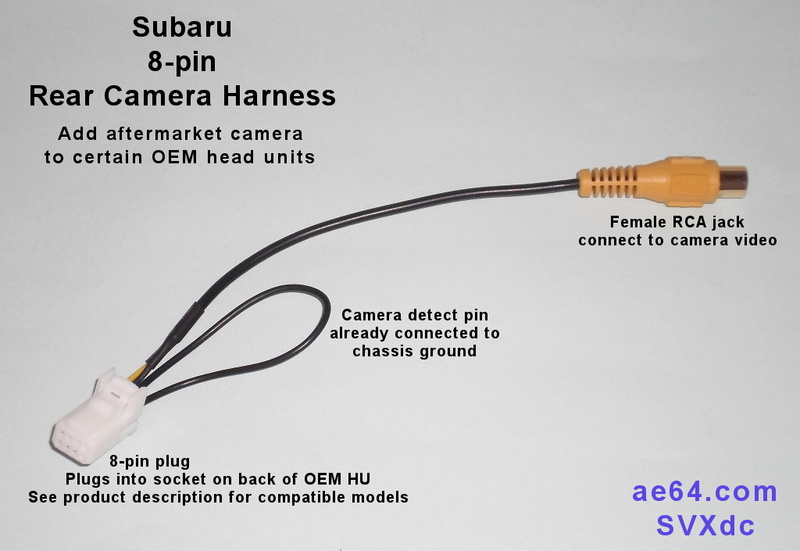 They are intended to be added to Subaru models that have a pre-installed camera harness. 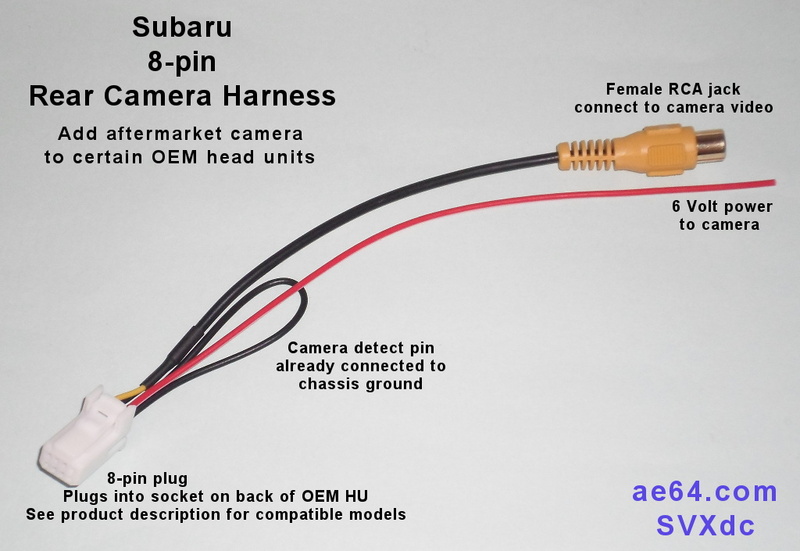 To install an OEM camera into a car that is not pre-wired, you will need to extend the camera's harness from the rear of the car to behind the HU. And no, I do not have a harness that fits the OEM camera's plug. If you would like to avoid cutting off the OEM camera's plug, pre-wired cars have an OEM harness in the trunk or tailgate with the matching socket for the camera. The last segment (with the camera socket) may be available as a repair part (however, they are a bit expensive). The harness is fairly short, so you would still need to extend it to the front of the car. Note: If the OEM camera is an option for your car and you want to add an OEM camera, you won't need my harness. Check with your Subaru dealer for details. If you are transplanting one of the OEM HUs with the 4.3" screen, check whether your car supplies the reverse gear signal to the HU. If not, I may be able to provide a short wire with the proper pin you can add to your car's factory harness (add $2). E-mail me for details, and tell me your car's year/model and the model numbers on the fronts of both your factory-installed and transplanted HUs.